The Cuisinart WAF-300 is a belgian waffle maker that cooks fluffy waffles and has stylish brushed stainless steel cover for adjusting temperature. The waffle maker comes with six settings that create customized results to meet all tastes. 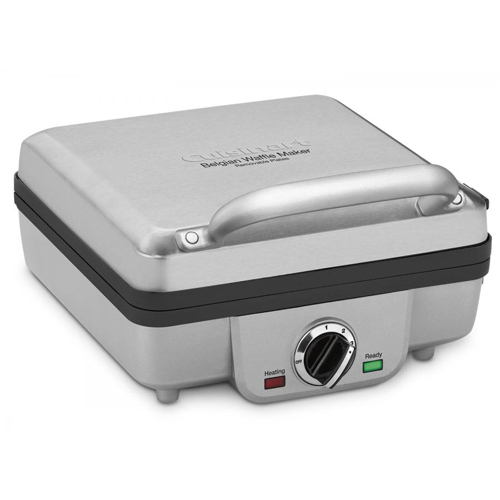 Its nonstick coated removable plates easily releases the complete waffles and cleans up easily. The 4-Slice Belgian Waffle Maker With Pancake Plates has many exciting features for users of all types. You can extend the lifetime of your 4-Slice Belgian Waffle Maker With Pancake Plates with the purchase of a FactoryOutletStore Factory Protection Plan. See the 4-Slice Belgian Waffle Maker With Pancake Plates gallery images above for more product views. The 4-Slice Belgian Waffle Maker With Pancake Plates is sold as a Brand New Unopened Item.